What did Mr Petronski's letter say? Mr Pertronski's letter said that Wanda would not come to school anymore. They were moving away to a big city. He also said that there, nobody would ask them why they had funny names because there were plenty of funny names in the city. Is Miss Mason angry with the class, or is she unhappy and upset? Miss Mason was unhappy and upset. She said that she was sure that none of the boys and girls of Room Thirteen would purposely and deliberately hurt anyone's feelings. She preferred to think that what was said was said in thoughtlessness. She thought of it as a very unfortunate thing to have happened and wanted everybody in the class to think about it. How does Maddie feel after listening to the note from Wanda's father? What does Maddie want to do? What excuses does Peggy think up for her behaviour? Why? What are Maddie's thoughts as they go to Boggins Heights? Why does Wanda's house remind Maddie of Wanda's blue dress? What does Maddie think hard about? What important decision does she come to? Why do you think Wanda's family moved to a different city? Do you think life there was going to be different for their family? What did the girls write to Wanda? Maddie thought her silence was as bad as Peggy's teasing. Was she right? Did they get a reply? Who was more anxious for a reply, Peggy or Maddie? How do you know? Peggy says, "I never thought she had the sense to know we were making fun of her anyway. I thought she was too dumb. And gee, look how she can draw!" What led Peggy to believe that Wanda was dumb? Did she change her opinion later? How did the girls know that Wanda liked them even though they had teased her? Here are thirty adjectives describing human qualities. 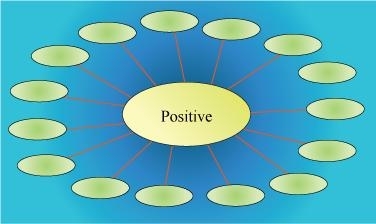 Discuss them with your partner and put them in the two word webs (given below) according to whether you think they show positive or negative qualities. You can consult a dictionary if you are not sure of the meanings of some of the words. 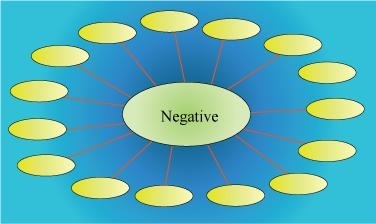 You may also add to the list the positive or negative 'pair' of a given words. kind, sarcastic, courteous, arrogant, insipid, timid, placid, cruel, haughty, proud, zealous, intrepid, sensitive, compassionate, introverted, stolid, cheerful, contented, thoughtless, vain, friendly, unforgiving, fashionable, generous, talented, lonely, determined, creative, miserable, complacent. What important decision did Maddie make? Why did she have to think hard to do so? Why do you think Wanda gave Maddie and Peggy the drawings of the dresses? Why are they surprised? Do you think Wanda really thought the girls were teasing her? Why or why not? What adjectives can we use to describe Peggy, Wanda and Maddie? You can choose adjectives from the list above. You can also add some of your own. 1.Find the sentences in the story with the following phrasal verbs. Colours are used to describe feelings, moods and emotions. Match the following 'colour expressions' with a suggested paraphrase. First Flight - English : CBSE NCERT Exercise Solutions & Summary for Class 10th for The Hundred Dresses - II will be available online in PDF book form soon. The solutions are absolutely Free. Soon you will be able to download the solutions.